Sirocco showing off what she normally has hidden under the water. A year on the Contessa 26 was enough to convince me that I wanted a bit more boat. I was enjoying the minimalism, but the Contessa was a little too small for long-term living aboard, at least for me and all of the tools that I normally carry. I started casually looking around and found a William Atkin-designed “Ben Bow” named Sirocco. She was sturdy, reasonably roomy, and had a lean, low profile that I just couldn’t resist. She also had a full keel with a rather deep forefoot. This was the boat that finally sold me on full-keel boats. At first I was a little apprehensive about how she would handle, but that fear was soon put to rest as I discovered how wonderfully predictable she was and what a joy to sail. True, she didn’t turn as tightly as a fin-keel boat, but the penalty in turning radius was not nearly as bad as I thought it would be. 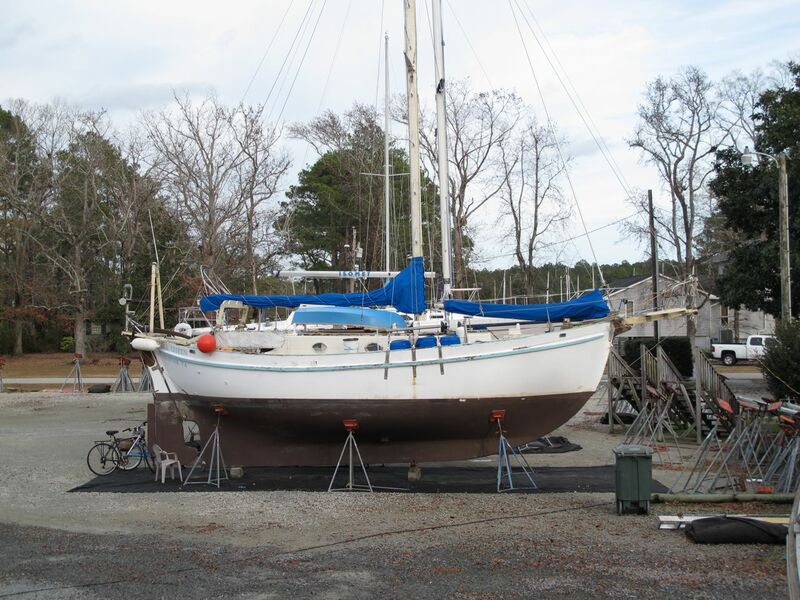 Also, I had not anticipated how her full keel, outboard rudder, and low freeboard up forward would combine to eliminate the tendency that so many other boats have for their bow blow away from the wind in an instant when stopped. Docking in a crosswind was now a much more controlled evolution. The same with singlehanded anchoring. Unless it was blowing a gale, I had plenty of time to stroll up the wide side decks and release the anchor after reaching my desired spot without the boat taking off across the wind. Backing was also improved over the cutaway-keel design, with the long keel making it easier to keep the boat tracking straight when desired. There were other benefits not related to handling at low speeds and close quarters that were pleasant surprises. Tracking when under sail at sea was superb, and I could balance the boat to sail herself in most conditions, but I had expected that to be true. One thing that I had not considered was how the deep bilges, outboard rudder, and near-vertical sternpost combined to put the propeller in a location where I could reach it from the dinghy. What luxury to be able to keep the prop clean without having to dive under the boat! I suspect that I may have also been able to unwrap a line from the relative comfort of the dinghy, but I never picked up a line in the prop in all the miles that I sailed in Sirocco, probably thanks to the protection offered by her keel. Finally, and probably only due in part to the design of her keel, Sirocco was one of the most comfortable boats that I have ever taken to sea. Even though I am normally somewhat prone to seasickness when I first put to sea, I was never once seasick aboard Sirocco. That comfortable motion was a tremendously endearing characteristic of hers, but I have to also give credit to her other design attributes, including short overhangs, moderately slack bilges, relatively heavy displacement, moderate beam, etc., as contributing factors in that department. Now that I am moving up to another boat, I again chose a full-keel design in the Dreadnought 32, Idle Queen. I am looking forward to continuing to enjoy the benefits of being able to inspect and reach the prop from my dinghy; having a boat that tracks well in a variety of conditions; not worrying about picking up lines and weed on the rudder and propeller; and having the option to comfortably dry out on a grid or beach if I ever need to. 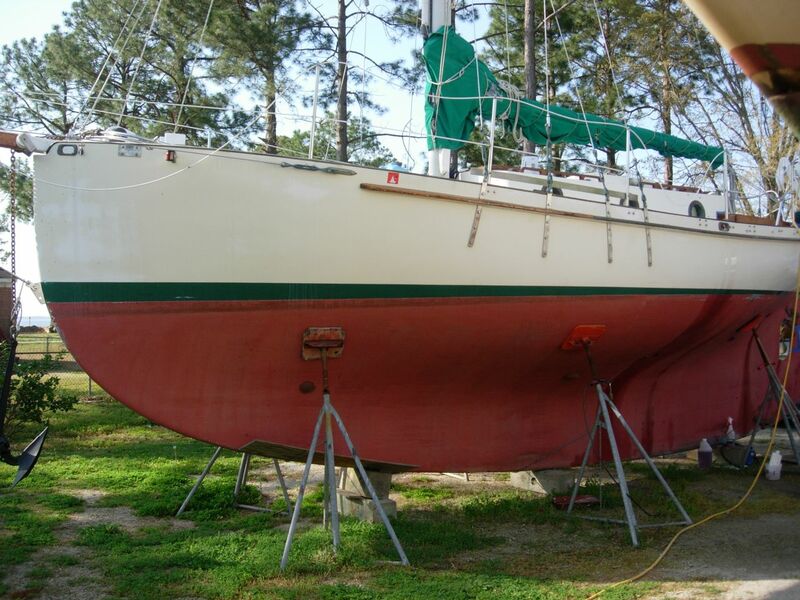 The full keel design has much to recommend it when choosing an underbody for a cruising sailboat. Thanks for taking the time to send me the comment, Tim! I was recently sailing on a fin-keeled boat where we worried all night long about picking up unmarked fishing nets. It definitely made me miss the way my full-keeled boat just sails over lines and nets. That characteristic is a great advantage for both sailors and fishermen alike. Thanks for letting me aboard for her passage to here. Sure would like to see her sailing in the same wind one day with ‘ANN’, my own Dreadnought.